The significance of industrial manufacture of dentures is increasing. With ULTRASONIC 10 chip removal, DMG has developed a milling method that allows the efficient machining especially of hard and brittle materials, such as ceramics and synthetic materials. 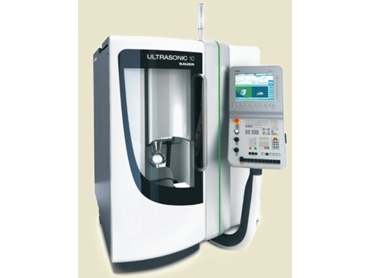 The ULTRASONIC 10 chip removal system combines this advanced production technology with a highly compact machine design especially devised for small and medium-sized dental laboratories. Due to simultaneous 5-axis machining, all features can be produced in one clamping position. When combined with an optional automation system, the ULTRASONIC 10 chip removal system represents an ideal component within an industrialised and productive process chain. To view this entire story from the September issue of Australian Manufacturing Technology please visit AMTIL 's Ferret listing and follow the links from there.